#p90047,Микулишна писал(а): Кто что может сказать по поводу этого препарата? Лен, у меня нет опыта приема этого препарата. Просто, может быть, не надо бояться его употреблять, поскольку антидиабетические бигуаниды (а он как раз и относится к этому классу), а также заменители сахара относятся, согласно последним исследованиям, к геропротекторам, а также для профилактики и лечения опухолей. О! Геропротектор! Может попить тоже, лежит пачка глюкофажа, ни туда и не сюда. One of the most important CRM's is the anti-diabetic drug metformin, which modulates insulin action. In order to reduce blood glucose, insulin has to be produced in sufficient amounts, but it also has to bind to insulin receptors on the cells in the body. Aging causes an increased difficulty in the smooth operation of this process, and there is a situation whereby insulin cannot effectively bind to the receptors, therefore it does not perform its duties properly. This is called 'increased peripheral resistance' to insulin, and it is a cardinal sign in diabetes and aging. Drugs which help mitigate this problem have existed for several years, and new ones are being studied at present. Metformin (brand name Metforal ®), is a drug which has been in use for over 40 years against diabetes. It is considered to be a receptor sensitizer, because it enhances the sensitivity of insulin receptors on the surface of muscle and fat cells (12). In addition, it also increases the actual numbers of receptors. While other anti-diabetic drugs stimulate the pancreas to produce more insulin, metformin only increases the sensitivity to insulin and does not influence its secretion. The upside of this, is that metformin does not usually cause insulin-dependant hypoglycaemia. When the insulin receptors are as sensitive to insulin as possible, the levels of circulating glucose falls, fat metabolism becomes more balanced and the weight of the patient is reduced (13). Apart from being a receptor sensitizer, metformin also reduces glucogenesis, (glucose production by the liver) and inhibits excessive absorption of glucose by the gut, (14) thus contributing to the overall glucose-lowering effect. Specifically, French researchers from the Laboratory of Endocrinology, Metabolism and Development in Paris, have confirmed that metformin is able to activate genes which reduce the production of glucose by the liver, thus reducing the risk of glycosylation and other age-related damage. Chemical agents such as lactate, pyruvate, alanine and galactose can be used by the liver to create new molecules of glucose. Metformin can alter the expression of genes which make this conversion possible, thus reducing glucose concentration as a whole and, especially, reducing the concentration of toxic by-products of glucose. In addition, metformin can reduce the gene expression for enzymes which increase oxidation of fatty acids. These enzymes, (such as palmitoyltransferase I) contribute to the oxidation of fats resulting in cell membrane disruption and eventual cell death. But the formation of these enzymes is blocked by metformin which ultimately saves the cell from an untimely death. At the same time, genes which encode for proteins that modulate glycolysis, (destruction of glucose) are activated by metformin. In the French experiment, expression of genes encoding for glucokinase and liver-type pyruvate kinase, (two enzymes which are involved in glycolysis) was increased by 250% following treatment with metformin (15). It is worth remembering that CR also results in modulation of genes, (16) which affect glucose formation in the liver (high when needed, and low when not needed), influence glycolysis (i.e. glucose elimination, which is high when energy is needed by the rest of the body, and low when not needed), containment of the glycolysis by-products which may contribute to glycosylation, and reduction of tissue levels of AGEs, as well as a reduction in fatty acid oxidation, all of which correspond to the same actions of metformin genetic effects. Therefore, the case for metformin being a CRM is strengthened further. As mentioned above, using GeneChips is a quick way to test the status of several thousand genes which may affect aging. In an experiment, scientists tested (on mice) four compounds known to affect glucose metabolism. They tested the status of 12422 genes and found that metformin was twice as effective as the other compounds in mimicking the effects of CR. It affected a total of 63 genes, particularly those involved in energy production, protein formation and degradation, cell growth, and detoxification (17). Metformin works along several different pathways, in order to control glucose activities, modulate insulin action and reduce cell death, eventually increasing life-span. But metformin does not always operate directly via glucose and insulin modulating pathways. It has many other 'glucose-independent' activities. With reference to Hormesis, (see footnote 1) metformin is able to modulate the stress response, in other words, it takes part in adjusting the cellular activities following mild stress. A specific biochemical pathway is through activation of AMPK. This is a protein kinase (an enzyme) which is normally active within the cell following multiple stresses. AMPK stands for 'Adenosine Mono Phosphate- activated protein Kinase', and is, as the name suggests, activated by Adenosine Mono Phosphate (AMP), an energy-rich molecule (18). Normally AMPK is switched on by stresses such as hypoxia (low oxygen), glucose deprivation, ischaemia or muscle contractions (which increase the energy demands). Once activated, AMPK initiates biochemical activities which prevent and repair cell damage, by leading to a sudden bout of energy production and by switching off any energy-demanding processes which are not directly essential for the survival of the organism. For example, it blocks the long-term production of complex proteins, lipids and carbohydrates which are not needed for the immediate survival of the cell, i.e. it behaves as if the body is in 'survival mode.' (But when the presence of these proteins/lipids/carbohydrates becomes essential at a later stage, when the emergency is over, then other mechanisms take over to start creating them again at the right amounts and concentrations so that to keep the cells multiplying again). This is exactly what happens during CR when the body is in 'survival mode' and when the nutritional stress of low a calorie diet activates pathways which increase cell repair. Metformin, and another anti-diabetic drug rosiglitazone were shown to activate AMPK (whereas insulin blocks AMPK) and, as a result, glucose metabolism and cell repair are kept in balance. This is important because a healthy AMPK status reflects an optimal heart function (19). It was also suggested that, by keeping AMPK active, metformin contributes to the beneficial effects of exercise seen in the treatment of diabetes (20). In addition, when metformin activates AMPK in the liver, the production of enzymes which help form new lipid molecules is reduced (21). In other words, metformin through the AMPK process blocks the accumulation of fat. CR causes a mild nutritional stress with low energy available to the cells. This stressful event activates AMPK which aims to rebalance the process of energy formation, and repairs any cell damage, (including any coincidental age-related cell damage) while switching off any processes not necessary for immediate survival. Therefore, the cell survives and the organism ultimately lives longer. Metformin, being a mimetic of CR, results in the same effect by directly activating AMPK which confers the above benefits to cell repair. The main point here is that it may not be necessary to have to undergo a period of CR to achieve cell repair, when metformin can do this itself by working on the same mechanisms as those involved in CR. Patients with significant kidney or liver disease, or those with heart failure should avoid taking it. Common and mild side effects are nausea, vomiting or abdominal bloating. The normal anti-diabetic dosage for metformin is 500 mg twice a day, or 850 mg daily. This can be increased as necessary to a maximum of 3000 mg a day. However, the dose required for calorie restriction mimetic effects has not been calculated formally. In mice, a dose of 300 mg/kg/day has been shown to reduce body temperature (a CR mimetic effect). But this cannot be extrapolated to humans, as it will mean 21000 mg for an average male. Further research is needed to clarify this point. Healthy people who take metformin for its general anti-ageing benefits use 500 mg twice a day. It is important to keep an eye on the blood biochemistry during metformin treatment. Tests commonly performed are fasting glucose and lipid status, liver and kidney function and haemoglobin A1c which is a glycosylated haemoglobin indicating the effectiveness of glucose control in the body. A low A1c means that the level of glucose (and therefore, indirectly, the level of glycosylation damage) in the body is well-controlled. Normal levels are those below the value of 5%. People who drink alcohol excessively should avoid metformin, or at least take it only under expert medical supervision. Один из самых важных CRM является анти-диабетические метформин препарат, который модулирует действие инсулина. Для того чтобы уменьшить уровень глюкозы в крови, инсулин должен быть получен в достаточных количествах, но он также должен связываться с рецепторами инсулина на клетки в организме. Старение вызывает повышенный трудности в бесперебойной работы этого процесса, и есть ситуация, когда инсулин не может эффективно связываться с рецепторами, поэтому он не выполняет свои обязанности должным образом. Это называется "увеличился периферического сопротивления" на инсулин, и это кардинальный знак при диабете и старении. Препараты, которые помогают смягчить эту проблему, существовали в течение нескольких лет, и новые изучаются в настоящее время. Метформин (торговая марка Metforal ®), является препарат, который был в эксплуатации более 40 лет против диабета. Это считается сенсибилизатором рецептора, потому что это повышает чувствительность инсулиновых рецепторов на поверхности мышц и жировых клеток (12). Кроме того, это также увеличивает фактическое количество рецепторов. В то время как другие противодиабетические препараты стимулируют поджелудочную железу вырабатывать больше инсулина, метформин только увеличивает чувствительность к инсулину и не влияет на его секрецию. Достоинством этого является то, что метформин обычно не вызывает инсулинозависимый гипогликемии. Когда рецепторы инсулина, как чувствительными к инсулину, насколько это возможно, уровни циркулирующих падает глюкозы, метаболизм жиров становится более сбалансированным и вес пациента снижается (13). Помимо того, что сенсибилизатор рецептора, метформин снижает glucogenesis также, (производство глюкозы печенью) и ингибирует чрезмерное поглощение глюкозы в кишечнике, (14), таким образом, вносит свой ​​вклад в общий эффект снижения глюкозы. В частности, французские исследователи из лаборатории эндокринологии, обмена веществ и развития в Париже, подтвердили, что метформин способен активировать гены, которые снижают выработку глюкозы в печени, тем самым снижая риск гликозилирования и других связанных с возрастом повреждений. Химические вещества, такие как лактат, пируват, аланин и галактозы могут быть использованы в печени, чтобы создать новые молекулы глюкозы. Метформин может изменить экспрессию генов, которые делают возможным это преобразование, тем самым уменьшая концентрацию глюкозы в целом и, в частности, снижение концентрации токсичных побочных продуктов глюкозы. Кроме того, метформин может уменьшить экспрессию генов ферментов, которые повышают окисление жирных кислот. Эти ферменты (таких, как palmitoyltransferase I) способствовать окислению жиров в результате нарушения клеточной мембраны и в конечном итоге гибель клеток. Но образование этих ферментов блокируется метформина что в конечном итоге экономит клетку от преждевременной смерти. В то же время, гены, которые кодируют белки, которые модулируют гликолиз, (разрушение глюкозы) активируются метформина. Во французском эксперименте, экспрессию генов, кодирующих для глюкокиназы и печени типа пируваткиназы (двух ферментов, которые участвуют в гликолиза) был увеличен на 250% после лечения метформином (15). Стоит помнить, что CR также приводит к модуляции генов, (16), который влияет на формирование глюкозы в печени (высокая, при необходимости, и низкий, когда не требуется), влияние гликолиза (т.е. устранение глюкозы, что является высоким, когда энергия нужна остальная часть тела, и низким, когда не требуется), сдерживание гликолиза побочных продуктов, которые могут способствовать гликозилирования, и уменьшение уровней тканевых АПЭ, а также снижение окисления жирных кислот, все из которых соответствуют к Те же действия, метформина генетических эффектов. Таким образом, в случае метформина будучи CRM укрепляется дальше. Как упоминалось выше, с помощью GeneChips быстрый способ, чтобы проверить состояние нескольких тысяч генов, которые могут повлиять старение. В эксперименте, ученые испытания (на мышах) четырех соединений, известных влияет на метаболизм глюкозы. Они проверили состояние 12422 генов и обнаружили, что метформин был в два раза эффективнее других соединений в имитации эффектов CR. Это отразилось в общей сложности 63 генов, в частности, тех, кто участвует в производстве энергии, формировании белка и деградации, роста клеток, и детоксикации (17). Метформин работает по нескольким различным путям, для того, чтобы контролировать деятельность глюкозы, инсулина модулировать действие и уменьшить гибель клеток, в конечном итоге повышение продолжительность жизни. Но метформин не всегда работают непосредственно через глюкозы и инсулина модулирующих путей. Она имеет много других "глюкозы независимой" деятельности. Со ссылкой на гормезис, (см примечание 1) метформин способен модулировать реакцию на стресс, другими словами, он принимает участие в корректировке клеточные активности следующие мягким стрессом. Конкретный путь является биохимические через активацию AMPK. Это протеинкиназа (фермент), который, как правило, активны в клетке после нескольких напряжений. AMPK означает «Аденозин Моно фосфатов активируемой протеинкиназы", и, как следует из названия, активируется аденозин фосфат Mono (AMP), богатого энергией молекулы (18). Обычно AMPK включен стрессами, такие как гипоксия (недостаток кислорода), лишение глюкозы, ишемии или мышечных сокращений (которые увеличивают энергетические потребности). После активации AMPK инициирует биохимические деятельности, предотвращения и повреждения ремонт клеток, приводя к внезапной схватки производства энергии и выключения каких-либо энергетических требовательных процессов, которые напрямую не важное значение для выживания организма. Например, он блокирует долгосрочного производства сложных белков, липидов и углеводов, которые не являются необходимыми для немедленного выживания клетки, т.е. он ведет себя так, как будто тело находится в режиме выживания ". (Но когда присутствие этих белков / жиров / углеводов становится необходимым на более позднем этапе, когда аварийной ситуации, то другие механизмы взять на себя, чтобы начать создавать их снова в нужном количестве и концентрации, так что, чтобы сохранить клетки умножения снова) , Это именно то, что происходит во время, когда CR тело находится в режиме выживания "'и, когда напряжение питания низком калорий активизирует пути, которые увеличивают восстановление клеток. Метформин, а другой антидиабетические розиглитазон наркотиков были показаны, чтобы активировать AMPK (тогда инсулина блоков AMPK) и, как следствие, метаболизм глюкозы и ремонт клеток находятся в равновесии. Это важно, поскольку здоровое состояние AMPK, отражает оптимальную функцию сердца (19). Было также высказано мнение, что, сохраняя AMPK активным, метформин способствует благотворному воздействию физических упражнений видели в лечении сахарного диабета (20). Кроме того, когда активируется метформин AMPK в печени, производство ферментов, которые способствуют формированию новых молекул липидов снижается (21). Другими словами, метформин через процесс AMPK блоков накопления жира. CR вызывает легкую питательную стресс с низкой энергией, доступной для клеток. Это стрессовые события активизирует AMPK, которая направлена, чтобы сбалансировать процесс формирования энергии, и ремонт любой ущерб клеток (в том числе любой совпадающей возрастной повреждения клеток), а выключение любые процессы, необходимые для не непосредственной выживания. Таким образом, клетка выживает и организм в конечном счете, живет дольше. Метформин, будучи миметика ЧР, приводит к тем же эффектом, непосредственно активируя AMPK, который придает выше преимущества ремонта клеток. Главное здесь в том, что он не может быть необходимо иметь, чтобы пройти период ЧР добиться ремонта клеток, когда метформин может сделать это сам, работая на тех же механизмов, как тех, кто участвует в ЧР. Пациенты со значительным почек или печени, или те, с сердечной недостаточностью следует избегать его. Общие и мягкие побочные эффекты: тошнота, рвота или вздутие живота. Нормальный антидиабетический доза метформина составляет 500 мг два раза в день, или 850 мг в день. Это может быть увеличена в случае необходимости до максимум 3000 мг в день. Тем не менее, доза, необходимая для ограничения калорий миметических эффектов не была рассчитана формально. У мышей, в дозе 300 мг / кг / день было показано, что снижение температуры тела (миметик эффект CR). Но это не могут быть экстраполированы на людей, как это будет означать, 21000 мг для средней мужчина. Необходимы дальнейшие исследования, чтобы прояснить этот момент. Здоровые люди, которые принимают метформин для своих общих преимуществ омолаживающий использовать 500 мг два раза в день. Важно, чтобы держать глаза на биохимию крови во время лечения метформином. Тесты обычно проводится натощак глюкозы и липидов, состояние печени и почек и гемоглобина A1c, который является гликозилированного гемоглобина указывает на эффективность контроля уровня глюкозы в организме. Низкий A1c означает, что уровень глюкозы (и, следовательно, косвенно, уровень повреждений гликозилирования) в организме хорошо контролируемой. 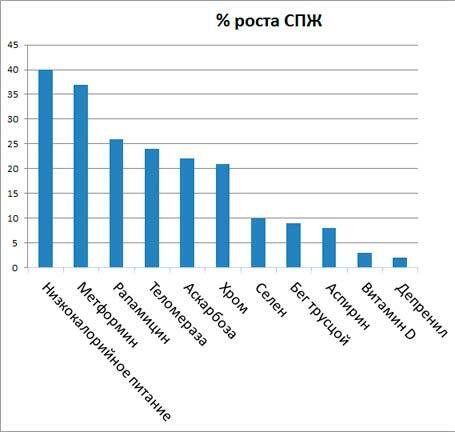 Нормальные уровни это те, ниже значения 5%. Люди, которые пьют алкоголь чрезмерно следует избегать метформин, или по крайней мере взять его только под наблюдением медицинских экспертов. Микулишна писал(а): Кто что может сказать по поводу этого препарата? Я уже писала, что Светлана(Монатурал) рекомендовала мне метформин. И хотя к фарм препаратам я отношусь резко отрицательно, купила его, но решила проверить на биорезонансе на совместимость. Он оказался не пригоден для меня. Я купила другой - тоже не подошел. Моя подруга потом их проверяла на других пациентах, думала, может кому-то подойдет, но потом так его и выбросила. Кстати, Хром, о котором я писала ранее прекрасно воздействует на инсулинрезистентность, так что на нем и остановилась. Причем, Светлана писала, что хром можно пить до 1 гр в сутки. Я в начале выпивала по 3 капсулы в день, т.е 600 мг, окончательно забыла про сладкое и жорики. Влияние различных геропротекторов на среднюю продолжительность жизни млекопитающих (прирост в %). Из лекарств лидирует препарат метформин. Как видно из графика, препарат метформин обладает наибольшей эффективностью среди известных науке лекарственных средств для продления жизни и уступает лишь немного низкокалорийной диете. Здесь наглядно показан ещё один аргумент в пользу метформина, как самого изученного средства продления жизни и замедления наступления старости. Препарат метформин спас от рака столько людей, сколько ни один препарат в мире. Мы уже подробно об этом писали. Интересный факт, что даже введение теломеразы, которая должна увеличивать теломеры и вызывать рост продолжительности жизни, всё равно не даёт такого эффекта как препарат метформин. Также интересно, что депренил, который, как раньше предполагалось, должен был давать колоссальный прирост продолжительности жизни, показал себя малоэффективным. Бег трусцой хоть и не сильно продлевает жизнь, но явно улучшает самочувствие. Селен доказано продлевает жизнь у людей на 7 лет. Аспирин предупреждает многие формы рака и сердечно-сосудистые заболевания — тем самым продлевает жизнь. Кроме того аспирин замедляет темпы прогресса возрастного угасания иммунитета. Источник информации: Алексей Москалев «120 лет жизни – только начало: Как победить старение?» 2014 год. "У вас нет необходимых прав для просмотра ссылок в этом сообщении.". Метформин снижает смертность у людей. Группа исследователей из крупной медицинской организации Kaiser Permanente в США изучила влияние приема метформина на риск возникновения рака легкого у больных диабетом. В более ранних наблюдательных исследованиях сообщались противоречивые оценки этой связи, в данной работе, опубликованной в журнале Cancer Prevention Research, авторы постарались учесть возможные методологические недостатки. В результатах данной работы было показано, что длительное, более 5 лет, использование метформина, связано со снижением заболеваемости аденокарциномой легкого у некурящих на 31%, и увеличением на 82% риска мелкоклеточной карциномы у курящих пациентов. В ретроспективное когортное исследование были включены 47351 больных сахарным диабетом, 54% из которых были мужского пола. Возраст участников был от 40 лет и старше. Пациенты заполняли опросник о состоянии здоровья с 1994 по 1996 годы. Сведения о приеме противодиабетических препаратов собирались из информационной системы аптек. Участники, которые в течение полугода приобретали метформин по рецептам хотя бы дважды, относились в группу использовавших этот препарат. В течение 15 лет наблюдения рак легкого был выявлен у 747 пациентов. Из них 80 человек никогда не курили, а 203 продолжали курить на момент диагноза. Прием метформина не снижал вероятность рака легкого в общей группе. При этом у никогда не куривших пациентов с диабетом, получавших метформин, риск был на 43% ниже, и наблюдалась тенденция к снижению риска при более длительном использовании препарата. Вероятность развития аденокарциномы, самого распространенного типа рака легкого, у некурящих снижалась на 31% при приеме метформина более 5 лет. При этом у курящих наблюдалось повышение риска мелкоклеточного рака легких на 82%. Авторы пришли к выводу о различном влиянии метформина на вероятность развития рака легкого в разных подгруппах пациентов. Необходимы дальнейшие исследования, чтобы прояснить наблюдавшиеся взаимосвязи. Результаты нового систематического обзора, опубликованные в журнале Journal of the American Medical Association (JAMA), показали, что один из самых распространенных лекарственных препаратов для лечения сахарного диабета 2 типа – метформин – безопасен для здоровья пациентов с легкой и умеренной формой заболевания почек, что противоречит существующим рекомендациям. В течение 20 лет метформин использовался в США и считался препаратом номер один для снижения концентрации сахара в крови у пациентов с сахарным диабетом 2 типа. Несмотря на высокий профиль безопасности метформина, Управление по контролю качества пищевых продуктов и лекарственных препаратов США (U.S. Food and Drug Administration, FDA, США) долгое время рекомендовало не выписывать это лекарство пациентам с легкой и умеренной формой болезни почек из-за риска развития лактоацидоза. Сегодня рекомендации более чем десятилетней давности вызывают вопросы. Доктор, профессор медицины Сильвио Е. Инзуччи (Silvio E. Inzucchi) из Йельского Университета (Yale University, США) и его коллеги из Йельского Университета, Юго-Западного Медицинского Центра при Университете Техаса (University of Texas Southwestern Medical Center, США) и Астонского Университета (Aston University, Великобритания) провели систематический обзор опубликованных результатов исследований, направленных на оценку риска развития лактоацидоза у пациентов с сахарным диабетом и сопутствующей легкой и средней формой заболевания почек, принимающих метформин. Анализ данных показал, что риск развития лактоацидоза у этих пациентов крайне низкий, он даже ниже риска, существующего для здоровья пациентов, не принимающих метформин. Заподозрил себя в огромном пережоре белков, и как следствие кетоз - не кетоз. т.е. на 4ке. Купил супербольшую пачку этого суперпепарата - чудес пока не ощущаю, и на тесте не вижу....Еще недельку попью. ccas7 писал(а): Заподозрил себя в огромном пережоре белков, и как следствие кетоз - не кетоз. т.е. на 4ке. Если 54% белка - гликогенные (горькая правда). То 46% же - кетогенные - сладкая правда. Д.С. писал(а): Если 54% белка - гликогенные (горькая правда). Далее учтено то, что жиры ~ на 10% состоят из глицерина, из которого синтезируется глюкоза. И 54% белка - его гликогенная часть. остальной белок - 46% - учтён вместе с жиром. Это его кетогенная часть..
Так это же моя любимая статья! Только я о цифрах не задумывалась, что они означают в формуле. Просто тупо считала и радовалась, если результат получался хороший. У мамы стал уровень глюкозы повышен. Д.С. писал(а): У мамы стал уровень глюкозы повышен. А часто еще и надо говорить близким, что мы хотим видеть их здоровыми, а то для них это не всегда очевидно, чаще в таком возрасте люди воспринимают рекомендации, как придирки... Терпения тебе! И вообще, пока не умер отец - у него был диабет - низкоуглеводное питание было... было... а сечас посмотрел - булка хлеба за неделю. Конфетки, яблочки... Овощей от души хомячит - а говорит - еда не лезет... а куда же целая миска овощей помещается?! Ах составь мне меню... Чего?! Два года объяснений - и - составь? П-ц. Ну чо, купила вчерась метформину (Рихтер, 500 мг), расхрабрилась и прям вот в два часа дня как тяпнула таблеточку! Через полчаса заурчало. Я что-то прикимарила на часок (погода, видать, способствовала), а очнулась - меня колбасит, как при входе в кетоз! ye18 Я так поняла - типа гипогликемия, что ли?.. ye17 И жрать хочется - аж сил нет! Схватила уши копчено-вареные (из Ашана, ага), схрупала 100 граммовую пачечку (попутно сломав сиротливую стеночку зуба пятёрочки ), потом маскарпонь с какао/сахзамом/ромовой эссенцией граммов сто слизала - отлегло... Будем посмотреть дальше. Сегодня опять одну таблетку съем... Сдаётся мне, я мало хаваю - в аннотации написано, что нельзя низкокалорийку пользовать при поедании метформина. Микулишна писал(а): Сдаётся мне, я мало хаваю - в аннотации написано, что нельзя низкокалорийку пользовать при поедании метформина. "Не было у бабы писку, так купила шелудивое порося". Tatiana писал(а): Теперь, ещё и хавать будешь больше!!!! А как же! Молодёжь жрёт, а я чего отставать буду? Микулишна писал(а): А как же! Молодёжь жрёт, а я чего отставать буду? А после начинает от мыслей распирать. Отцу расскажу, а то в последнее время он слишком много думает, мысли в теле перестали помещаться. И первую строчку стишка он знает и регулярно повторяет, пора вторую выучить.